Berlin (AFP) – The Alternative for Germany (AfD) Sunday became the first hard-right, openly anti-immigration party to win dozens of seats in parliament since World War II, breaking a taboo despite mainstream politicians’ calls to halt “the Nazis” in their tracks. Exit polls credited the AfD with around 13 percent of the vote, making it the third biggest political force in Germany — a stunning result for a party that was founded just four years ago. “We will change this country,” vowed Alexander Gauland, one of the party’s top two candidates, pledging to “go after” Chancellor Angela Merkel’s government. It promised that it would make it a priority to launch a parliamentary probe against Merkel over her decision to let in a million asylum seekers since 2015. After already winning seats in 13 of 16 state parliaments, the AfD will now send dozens of lawmakers to the Bundestag opposition benches, giving them a platform to spread their views, including challenging Germany’s culture of atonement over World War II and the massacre of six million Jews and others in the Holocaust. “I expect all our democratic forces to unveil the real face of the AfD and to expose the party’s empty, populist promises,” Schuster said, calling on mainstream parties to close ranks and kick the upstarts out in the next election. Merkel acknowledged that the party’s entry into parliament posed a “big new challenge” and vowed to “win back AfD voters”, while the Social Democratic Party’s leader Martin Schulz vowed that his party, in opposition, would act as a “bulwark for democracy in our country”. 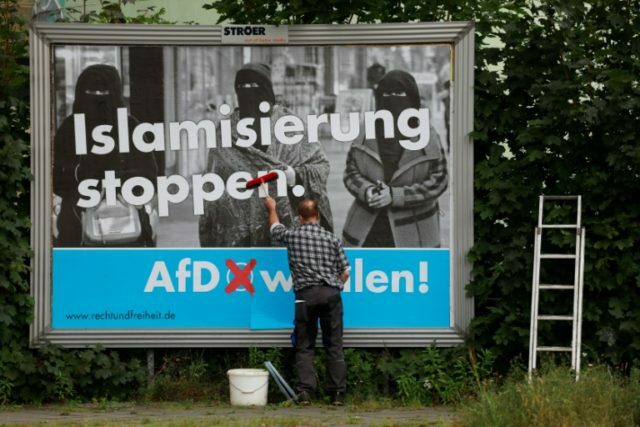 The AfD began life in 2013 as an anti-euro protest party but then shifted focus to capitalise on misgivings over the record migrant influx in Germany. Its tone turned increasingly extreme in the last stretch of campaigning, with one of its two leading candidates saying Germany should be proud of its war veterans and claiming that terror was grounded in Islam. Provocative posters declared “Burkas? We prefer bikinis” and “New Germans? Let’s make them ourselves”. Its supporters heckled Merkel’s rallies across the country, jeering, whistling and chanting “get lost” in attempts to drown her out. Foreign Minister Sigmar Gabriel, a Social Democrat, has warned that “for the first time since the end of the second World War, real Nazis will sit in the German parliament”. The AfD will be a pariah in parliament as all mainstream parties have ruled out working with it, but the populists could still be vocally disruptive from the opposition benches. A commentator in Spiegel weekly blamed Merkel for the rise of the AfD, saying she should be voted out simply for failing to stop “the Nazis from entering the Bundestag” on her watch. Critics say widening social inequality, despite record employment, is also playing into the hands of AfD populists, especially in the deindustrialised heartlands of the former communist east. The party captured close to one in four votes in the east, where it was the second strongest party. Thorsten Benner, head of the Global Public Policy Institute in Berlin, said the AfD’s rise shows that “our population is no more virtuous than the French population,” and that even France’s far-right leader Marine Le Pen “pales in comparison”. The AfD “will challenge key themes” in parliament, he said, pointing to Germany’s culture of wartime remembrance and debate on cultural identity. Gauland recently called for Germans to stop atoning for the past. He also said integration commissioner Aydan Ozoguz should be “disposed of in Anatolia”, suggesting she will never be German because of her Turkish origin. The presence of the AfD “will very much change the tone of debate in parliament,” Benner warned.